1972-10-01. Good. Ships with Tracking Number! INTERNATIONAL WORLDWIDE Shipping available. May not contain Access Codes or Supplements. May be ex-library. Shipping & Handling by region. Buy with confidence, excellent customer service! 1991-03-02. Good. Ships with Tracking Number! INTERNATIONAL WORLDWIDE Shipping available. May not contain Access Codes or Supplements. May be ex-library. Shipping & Handling by region. Buy with confidence, excellent customer service! International Pub., 1972. Stated first edition. Introduction by the Rev. Ralph David Abernathy. 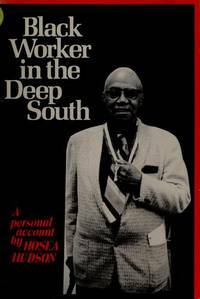 An account of labor organizing by African Americans in the South. Unread copy with spotting to edges, shelfwear to cover. 130 pp.. First Edition. Soft Cover. Very Good. Book. New York: International Publishers, 1972. Trade Paperback. x, 130p., wraps, first paperback printing. International Publishers Co, 1972-10. Hardcover. Acceptable. Intl Pub, 1991-05. Paperback. Good. Intl Pub, 1991-05-01. Paperback. Used:Good. New York: International Publishers, 1991. x, 130p., second edition, wraps. First published in 1972. New York: International Publishers, 1972. First Edition . Quality Paperback. Very Good. This title is IMMEDIATELY AVAILABLE. International Publishers Co. PAPERBACK. 0717803627 Good, clean text, paperback binding, light to moderate wear to corners and edges, may have previous owner's signature, remainder mark, sticker/residue, and/or other minor aesthetic flaws. Satisfaction guaranteed. Last Word Books & Press is an Infamous Independent Bookstore and Print Shop located in Olympia, Washington. . Good. International Publishers Co. PAPERBACK. 0717803627 Cover with edge/ shelf/ reading wear. No spine creases. Pages unmarked. Binding straight. Rippling of pages near spine often associated with this type of book. **Tracking on all US orders. Most orders shipped within 24 hours. International customers will be reimbursed a portion of unused shipping charges.*** . Good. Intl Pub. Paperback. GOOD. Spine creases, wear to binding and pages from reading. May contain limited notes, underlining or highlighting that does affect the text. Possible ex library copy, thatâll have the markings and stickers associated from the library. Accessories such as CD, codes, toys, may not be included.